Quirky came in from the Birmingham Track Adoption Kennel. He was a good racer there racing most of his 178 races at the top A level. He is a larger guy that raced at 80lbs. He will turn 8 on December 15th. His sire is an Irish import Ballymac Flight* and his dam is BD's Harper. Quirky did not pass his cat test so needs a home with no kitties. He did respond OK to the small dog he was tested with and realized quickly that it was a dog and not a bunny. Quirky's was initially fostered in a townhouse and was very quiet in his crate there. He was briefly in another apartment home and complained about being left there, so may not be a great apartment dog. He is a very easy, calm guy that would be great for a first time greyhound owner. He is a sweet guy that loves people. Great personality! Quirky has been in a home for 4 years. 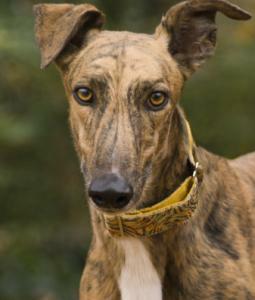 For a couple years he was living as an only dog, then they adopted another male greyhound, Ryan. Both boys were recently returned to us by because his family decided that they no longer wanted to have dogs. They said it absolutely was not a problem with either of the dogs, they were good dogs. We had a home wanting to adopt two bonded dogs together, so Ryan and Quirky are being fostered by her and will stay permanently if all goes well.